It's a classic, it looks great, and it's warm. 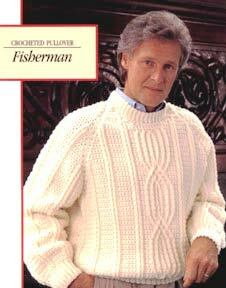 This handsome, richly textured pullover features fisherman-stitch patterns adapted in crochet. Directions are for Medium (38-40). Changes for Large (42-44), Extra Large (46) are in parentheses. 35 (38,41) ounces [990 (1089,1188) grams] worsted weight yarn. Size H and J crochet hook, or Size to obtain gauge. Pat st on size J hook: 3 sts = 1"; 25 rows = 7". Ribbing: With smaller hook, ch 12. Row 1: Wrong side. Sc in 2nd ch from hook, sc in each ch across - 11 sc. Do not chain. Turn. Row 2: Right side. Sc in back loop of first and each sc across. Ch 1, turn. Row 3: Sc in back loop of first and each sc across. Do not chain. Turn. Repeat rows 2 and 3 until 65 (69,73) rows have been completed. Fasten off. With smaller hook, join along edge of ribbing. Work 1 sc in each row along long edge of ribbing - 65 (69,73) sts. Ch 1, turn. Change to larger hook. Row 1: Wrong side. Sc in each sc across. Ch 1, turn. Row 2: Right side. Sc in each of next 2 (4,6) sc, [yo, insert hook from front around post of next sc 2 rows below, pull up a loop, (yo and pull through 2 loops) twice - raised dc - RDC; 1 RDC in next sc 2 rows below, skip the 2 sts behind the 2 RDC at the top, 1 sc in each of next 5 sc]; repeat from [ to ] 3 times more, (1 RDC around post of sc 2 rows below, 1 sc in next sc) 3 times; 1 sc in next 4 sc; repeat from [ to ] 3 times, 1 RDC around post of each of next 2 sc 2 rows below, 1 sc in each of last 2 (4,6) sc. Ch 1, turn. Row 3 and all wrong side rows: 1 sc in each sc and in each RDC across row. Ch 1, turn. Row 4: Sc in 2 (4,6) sc, [RDC around next 2 RDC, sc in next 5 sc] 4 times; (RDC around next RDC, sc in next sc) 3 times; sc in next 4 sc; repeat between [ ]s 3 times, RDC around next 2 RDC, sc in next 2 (4,6) sc. Ch 1, turn. Repeat Rows 3 and 4 until 16" from beg ending with a wrong side row. Row 1: Right side. Sl st across first 2 sc, ch 1, work in pat as established to within last 4 sts, work next st in pat as established, sc in next st, leave off last 2 sts. Ch 1, turn. Row 2: Sc in first st, dec 1 sc - draw up a loop in each of 2 sts, yo draw through all loops on hook, work pat as established to last 3 sts. dec 1 st, sc in end st. Ch 1, turn. Row 3: Work in pat as established always working first and last st in sc. Repeat the last 2 rows 19 (20,21) times more - 21 (23,25) sts. Fasten off. Work ribbing and foundation row same as for back - 65 (69,73) sts. Change to larger hook. Row 2: Right side. 1 sc in each of next 2 (4,6) sc, [1 RDC in each of next 2 sc 2 rows below, skip 2 sts behind RDC at the top, 1 sc in each of next 5 sc] repeat between [ ]s 2 more times, 1 RDC in each of next 2 sc 2 rows below; Central Panel - 1 sc in each of next 2 sc, (1 RDC in sc 2 rows below, 1 sc in next sc) 5 times, 1 RDC in next sc 2 rows below; 1 sc in each of next 2 sc (end of Central Panel); repeat from [ to ] 3 times, 1 RDC in each of next 2 sc 2 rows below, 1 sc in each of last 2 (4,6) sc. Ch 1, turn. Row 3 and all wrong side rows: Sc in each sc and in each RDC across - 65 (69,73) sts. Ch 1, turn. Row 4 and 6: 1 sc in each of next 2 (4,6) sc, [1 RDC around post of each of next 2 RDC 2 rows below, (1 sc in each of next 5 sc, 1 RDC around post of each of next 2 RDC 2 rows below) 3 times]; 1 sc in each of next 2 sc, (1 RDC around post of RDC 2 rows below, 1 sc in next sc) 5 times; 1 RDC around post of RDC 2 rows below, 1 sc in each of next 2 sc; repeat from [ to ], end 1 sc in each of last 2 (4, 6) sc. Ch 1, turn. Row 8: Work even in pat as established over first and last 25 (27, 29) sts. Central Panel: 1 sc in each of next 3 sc, 1 RDC around post of first RDC 2 rows below, 1 sc in next st, 1 RDC around post of 2nd RDC 2 rows below, skip 1 sc and next RDC; 1 long RDC (pull up so work is flat) around post of next RDC 2 rows below, 1 sc in skipped sc, 1 long RDC around post of first skipped RDC (first criss-cross completed). 1 RDC around post of next RDC, 1 sc in next st, 1 RDC around post of last RDC, 1 sc in each of next 3 sc. Row 10: Work even in pat as established over first and last 25 (27, 29) sts, 1 sc in each of next 4 sc, 1 RDC around post of first RDC, skip next sc and RDC, 1 RDC around post of next RDC 2 rows below, 1 RDC around post of skipped RDC 2 rows below (criss-cross made), skip 3 sts at the top; 1 sc in next sc, skip next RDC below, 1 RDC around post of next RDC 2 rows below; work 1 RDC under post of RDC just completed (Note: Push completed RDC forward so you can get under last criss-cross made) and around post of skipped RDC 2 rows below, 1 RDC around post of last RDC 2 rows below, skip 3 sts at the top, 1 sc in each of next 4 sts. Note: Beg with next pat row we will give instructions for the center 15 sts only, continue in established sc and rib pat over first and last 25 (27,29) sts. Be careful to see that you pick up correct RDC for it may be underneath and not too visible. It is a good idea to check number of sts on wrong side row to make sure you havent lost any. Row 12: 1 sc in 4 sc, skip first RDC, 1 RDC around post of next RDC 2 rows below, 1 RDC around post of skipped RDC, skip next RDC and sc, 1 long RDC around post of RDC 2 rows below, 1 sc in skipped sc, 1 RDC around post of skipped RDC, skip next RDC, 1 RDC around post of last RDC; RDC under post of last RDC inside and around post of skipped RDC 2 rows below, 1 sc in each of next 4 sc - 3 criss-cross completed. Row 14: 1 sc in each of next 3 sc, 1 RDC around post of first RDC 2 rows below, 1 sc in next sc, skip next RDC, 1 RDC around post of next RDC 2 rows below, 1 RDC around post of skipped RDC 2 rows below, 1 sc in next sc, skip next RDC, 1 RDC around post of next RDC 2 rows below, 1 RDC under post of last RDC made and around post of skipped RDC 2 rows below, 1 sc in next sc, 1 RDC around post of last RDC 2 rows below, 1 sc in each of next 3 sc. Row 16: 1 sc in each of next 2 sts, 1 RDC around post in first RDC 2 rows below, 1 sc in next sc, 1 RDC around post of next RDC 2 rows below, 1 sc in next sc, skip next RDC below and next sc, 1 RDC around post of next RDC 2 rows below, 1 sc in skipped sc, 1 RDC around post of skipped RDC 2 rows below, 1 sc in next sc, 1 RDC around post of next RDC 2 rows below, 1 sc in next sc, 1 RDC around post of last RDC 2 rows below, 1 sc in each of last 2 sc. Rows 18, 20, 22, 24: Same as Row 4. Repeat from Row 3 through 24 for pat st. Work even in pat until 14 (15,16) armhole decreases have been completed - 33 (35, 37) sts remain. Left side. Work across first 12 (13, 14) sts as established, leaving remaining sts unworked. Ch 1, turn. Keeping to pat, continue raglan shaping to correspond to back. At the same time, dec 1 st at neck edge every row 2 (2, 3) times, then every other row 3 (4, 4) times. Work raglan shaping until 1 st remains. Fasten off. Right side. Row 1: With right side facing, skip next (center) 9 sts on last complete row worked. Join yarn in next st, ch 1, complete row in pat - 12 (13,14) sts. Work to correspond to left side, reversing all shaping. Work lower rib to correspond to back for 37 (39, 41) rows. Fasten off. Foundation Row: Right side. Work 41 (45, 47) sc along long edge of rib. Change to larger hook. Row 1: Work sc across - 41 (45,47) sc. Ch 1, turn. Row 2: 1 sc in 4 (6, 7) sc, (2 RDC, 1 sc in 5 sc) 2 times, (1 RDC, 1 sc) 2 times, 1 RDC, (5 sc, 2 RDC) 2 times, 1 sc in 4 (6,7) sc. Work in pat as established, increasing 1 st each side every 6th row 5 (5, 6) times (to inc - work first st, work 2 sts in next st, work to within last 2 sts, work 2 sts in next st, work last st). Work all increase sts in sc - 51 (55, 59) sts. Work even until 18 (19, 20) from beg, or desired length to underarm, ending with wrong side row. Work same as for back armhole, ending with 7 (9, 11) sts remaining. Fasten off. Sew raglan seams, aligning rows so that each RDC row of sleeve meets corresponding RDC row of front and back. Sew side and sleeve seams. With right side facing, join yarn at center back neck. Rnd 1: Right side. With smaller hook, draw up a loop and ch 1, sc evenly around neck, taking in slightly to fit. Join with a sl st in first ch 1. Ch 1, turn. Rnd 2: Sc in each sc around, decreasing 1 st at each point of seam (4 sts dec). Join with a sl st. Fasten off. With smaller hook, ch 7. Work Row 1, then Rows 2 and 3 as for lower ribbing for back. Rep these 2 rows until piece (slightly stretched) fits around neck, ending with a right side row. Fasten off. Sew short edges of ribbing. With seam at center back, sew band to neck edge.